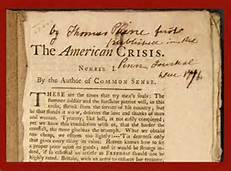 Thomas Paine wrote these famous words in his pamphlet The American Crisis, dated December 23, 1776, a time when Patriot forces stood on the verge of losing the Revolutionary War. Paine implored Americans to not give up the fight. George Washington ordered that the pamphlet be read aloud to his troops on Christmas Eve 1776 before they crossed the Delaware River to launch a surprise attack at Trenton. These are the times that try men’s souls. The summer soldier and the sunshine patriot will, in this crisis, shrink from the service of his country; but he that stands it now deserves the love and thanks of man and woman. Tyranny, like hell, is not easily conquered. Yet we have this consolation with us, that the harder the conflict, the more glorious the triumph. What we obtain too cheap, we esteem too lightly: ’tis dearness only that gives every thing its value. Heaven knows how to put a proper price upon its goods, and it would be strange indeed if so celestial an article as freedom should not be highly rated. . . .
Let it be told to the future world, that in the depth of winter, when nothing but hope and virtue could survive, the city and the country, alarmed at one common danger, came forth to meet it and to repulse it. . . . I love the man that can smile in trouble, that can gather strength from distress, and grow brave by reflection. ’Tis the business of little minds to shrink; but he whose heart is firm, and whose conscience approves his conduct, will pursue his principles unto death.